I’ve been thinking about simplifying my life all the time. I wanted to know how to live simply. I wanted to spend my time on important things. But I’ve found out it’s not that easy to do. There are a million distractions out there. Most especially now that the internet has brought infinite amounts of information, communication and entertainment within our reach, it’s been very difficult to find focus. A great idea that I’ve been thinking about exploring is minimalism. I’ve not really gotten much traction with employing this lifestyle yet. But I’ve come across pretty interesting people in the internet who’ve taken significant steps in their lives to live this way. 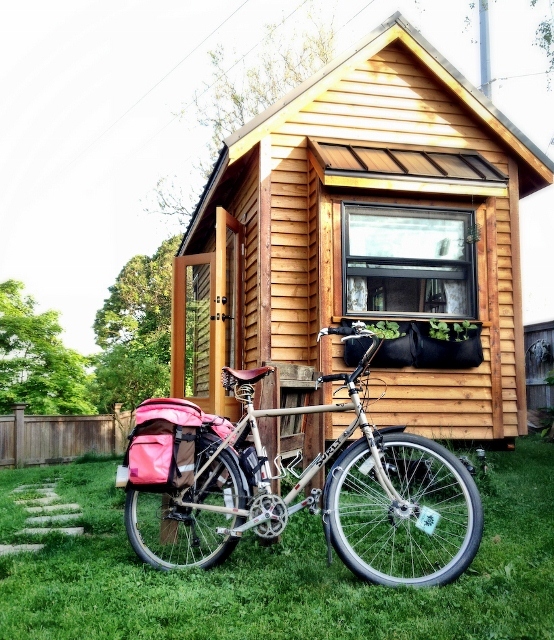 One particular blogger I’ve read about has become popular for moving to a very tiny house. It’s not just a small house but it’s a really tiny one. Imagine an area that is 8 feet by 16 feet. That’s as small as a parking spot. You would not normally think that people will prefer to live in such a tiny space. More so, it’s not easy to think that this would happen in the US where everything is big. But that’s exactly the description for the tiny house where Tammy Strobel and her partner lives in. Tammy is a blogger, writer and photographer who owns Rowdykittens.com. The photo above should give you a good idea how small this house really is. If you wish to know more about Tammy and her tiny house, I suggest you visit her blog. She is an excellent writer and I won’t be surprised if you fall in love with her works. I came across one of Tammy’s guest post on Zen Habits (Leo Babauta’s blog). I was so impressed by her writing that I went and check her website. I was even more impressed when I found out that she is an accomplished writer who now lives the way she does. I mean, going from an ordinary sized home to the one she now live in is a pretty big change. It’s a radical idea that she put into practice. Whenever I read stories like Tammy’s, I get inspired to do more and live more. I’m reminded of the important things that I should be focusing on. I’m not saying I own too much or that I spend most of my time on nothing valuable. But I think I have room for improvement. I feel that I have not attained the balance to both enjoy every moment while still being as productive as possible. I actually live in a relatively small apartment which is enough for the need of my family. But even with a simple life that we are living right now, I still feel that I have not reached my full potential to contribute and lead a more meaningful life. I feel that I can initiate some changes that will help me fulfill my dreams as a father, partner, blogger and engineer. As with most initiatives, the most difficult part will be the beginning. But I am optimistic that I’ll get passed it to get this rolling the way I want it.